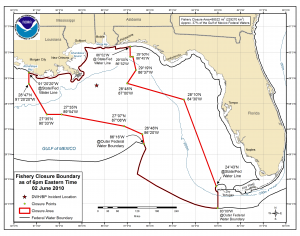 Click the map to learn more about the current fishery closure covering 37% of the Gulf (6/2/10). Yesterday, U.S. Senator Bill Nelson (D-FL) requested a fishery disaster designation for the state of Florida to assist fishermen, their families, and associated businesses who are feeling the impacts of the Oil Spill in the Gulf of Mexico. Today, the National Oceanic and Atmospheric Administration announced a closure of 37% of federal fishing waters, many along the coast of Florida. Just yesterday, 31% of the Gulf was closed and on Monday 26% was closed. These extensive and growing closures are already impacting the Gulf’s multi-billion dollar fishing and tourist industries. EDF supports Senator Nelson’s request, which will provide federal assistance to affected Florida fishermen and communities, and encourages U.S. Secretary of Commerce Gary Locke to make this designation. On May 24, the Department of Commerce made a disaster designation for Gulf of Mexico fisheries in Louisiana, Mississippi and Alabama. This entry was posted in Gulf of Mexico and tagged Fishery Disaster, Florida, Senator Bill Nelson. Bookmark the permalink. Both comments and trackbacks are currently closed.